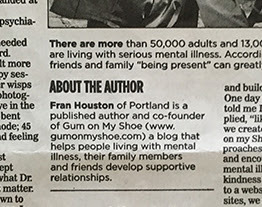 Fran’s op-ed article Maine Voices: Time for mental health awareness was published in the Maine Sunday Telegram on October 4, 2015, marking the start of Mental Health Awareness Week. 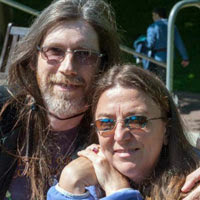 In it she described her history of mental illness, and her experiences working with psychiatrist George McNeil. Dr. McNeil gave me what I needed most — the sense of being heard. Somehow, I learned to be human again. Somehow I began to create habits for myself and grew a life I wanted. As my self-worth got woven together, I began to care. With Dr. McNeil’s help, I got better. I am not cured. My moods still swing. My symptoms still flare. But I now know how to surround myself with good souls who hold my hand while I try to balance on the seesaw of bipolar disorder. And I have tools in my wellness toolbox. 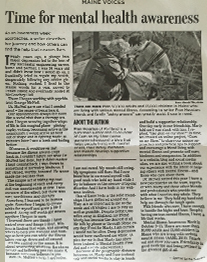 Maine Behavioral Healthcare (“Great article!”); Family Hope (“Fantastic article by Family Hope friend, Fran Houston. We are always amazed and appreciative of her openness to share her total self with the world.”); Catching Health, with Diane Atwood (“Beautifully expressed by Fran Houston, a woman with many gifts to share.”); Bob Keyes, journalist (“Courageous column about mental health awareness by my friend Fran Houston.”); NAMI Maine (“Well said!”). Raise your head, raise your heart.